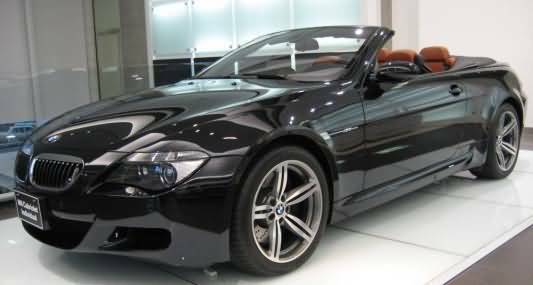 BMW M6 Convertible is a luxury car of D+ segment. The car has been launched in India keeping in mind the high income group car enthusiasts. The two door car is a perfect blend of style, appearance and powerful performance. Appearance: BMW M Series M6 Convertible is available in 9 scintillating colors – Alpine White, Silver Stone II, Silver Grey, Indianapolis Red, Sepang Bronze, Stratus Grey, Monaco Blue, Interlagos Blue and Black Sapphire. The frontage consists of body colored bumper, double kidney shaped front grille and Xenon headlamps. The rear side comprises of brake light and taillights cluster. Comfort: The two door car offers many comfort features. BMW M Series M6 Convertible has adjustable seats, specially designed M instruments and ergonomic M seats. The leather-wrapped steering wheel has multi-function buttons. The car also has tiltable steering column, cup holders, electrically adjustable outside mirrors and power windows. The M seats offer maximum body support to the driver. Other comfort features include Automatic Climate Control, Air Quality Control, Remote Trunk Opener, Remote Fuel Lid Opener, Low Fuel Warning Light, Trunk Light, Vanity Mirror, Rear Reading Lamp, Rear Seat Headrest, Rear Seat Centre Arm Rest, Height Adjustable Front Seat Belts, Removable/Convertible top, Glove Compartment and Cigarette Lighter. BMW M Series M6 Convertible has a powerful A.C., Heater and a Hi-tech Audio System. Safety: BMW M Series M6 Convertible is equipped with advanced safety features. The car has Driver Airbag, Passenger Airbag, Side Airbag-Front, Seat Belts, Central Locking, Power Door Locks, Child Safety Locks, Anti-Theft Alarm, Seat Belt Warning and Door Ajar Warning. The car has Anti-Lock Braking System, Brake Assist, Side Impact Beams, Front Impact Beams, Tyre Pressure Monitor, Vehicle Stability Control System, Advanced Safety Electronics (ASE) System, Engine Immobilizer, Crash Sensor and Engine Check Warning. Engine: BMW M Series M6 Convertible has 5.0L 507 bhp V10 petrol engine which produces a maximum power of 507PS at 7750 rpm and a maximum torque of 53 kgm at 6100 rpm. The engine is linked to a 7-speed sequential M transmission. Price: The price of BMW M Series M6 Convertible is Rs.1,31,90,000 (taking Mumbai as base price location). However, the price specified is only approximate price which excludes tax, registration, insurance and cost of accessories.